I am not a baseball fan. Oh wait. I am not a sports fan at all. On Monday mornings in my office when people discuss the games they watched on TV or in an actual stadium, my mind wanders. I’m wishing they would talk about where they ate instead. Which is why it may surprise people that I agreed to go see “Moneyball.” In fact, I didn’t put up a fight at all. I know you’re thinking that I saw it because of Brad Pitt. Not really. Brad is okay, but I am not one to see a film just because he’s in it. But the reviews were great and I read somewhere that you didn’t have to be a baseball fan to enjoy it. Truth is, I think you do. I found “Moneyball” a little tedious and I simply didn’t have enough context to keep me interested. Although I did google Billy Beane afterwards, as I was at least curious to find out how things have ended up for him. 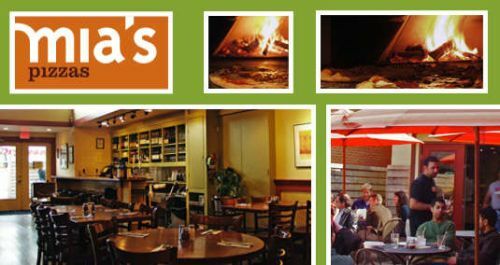 I’ve been to Mia’s Pizzas a few times, and I find the wood-fired pizza consistently good. 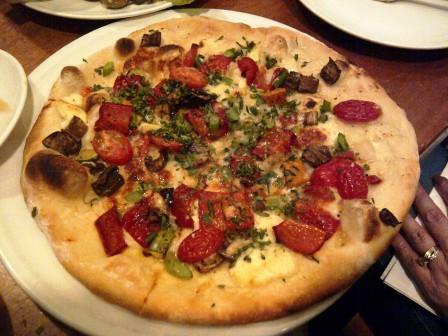 As a casual, neighborhood, after-a-movie kind of place, Mia’s Pizzas fits the bill. It’s hopping on a Sunday night and we have a bit of a wait for a table for four. The hostess is extremely apologetic and frequently leaves her post to check on the status of possible openings. I like that she cares. We are finally seated. My husband and I decide to share a caesar salad and arrabiata pizza with roasted vegetables, brocollini, cherry tomatoes, fontina, and pecorini cheese. 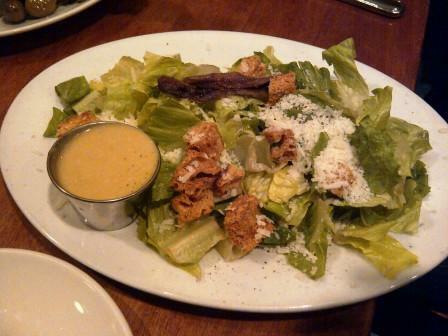 Simply put, the salad is fine although nothing special. I much prefer the chopped romaine salad with gorgonzola, bacon, and beets which I’ve had on previous visits, but I am trying for something a drop healthier to accompany my pizza. 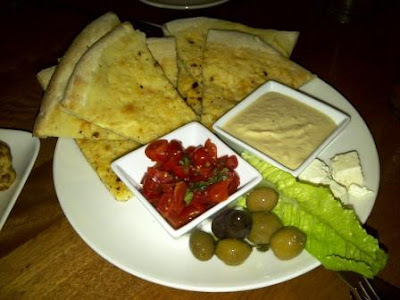 My friend has Mediterranean antipasto which includes hummus, olives, marinated tomatoes, feta cheese, and warm flatbread. It’s not something I would have thought to order here, but it ends up being more satisfying than the salad. 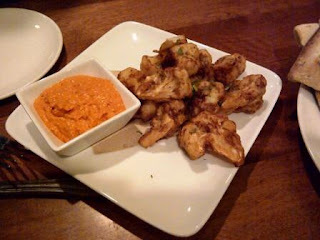 We also order cauliflower with red pepper tomato feta. The cauliflower is lightly fried and the tomato feta dip has a just touch of heat to give it some interest. I have to control the urge to eat too much. I want to save room for pizza but this is some pretty good stuff. Give me a slice of pizza with a crispy crust and I am happy. Thank you, Mia. Every time I’ve been here I have enjoyed a consistently crispy/chewy and flavorful crust. The pizza is light on the cheese (hence the crispness) which is fine with me. Our toppings are a fresh combination of eggplant, red pepper, squash, and mushrooms. I add a touch of red pepper flakes to give it a little more burn. This doesn’t bother me. As a diner it’s easier to add some spice to heighten flavor. There’s nothing you can do about a soggy crust. My friend has ordered a margarita pizza, which he finds a little bland. I should have suggested he add red pepper flakes but I don’t really think about it until it’s too late. I’m too busy eating my own pizza. As I do my research for this post, I find something interesting. 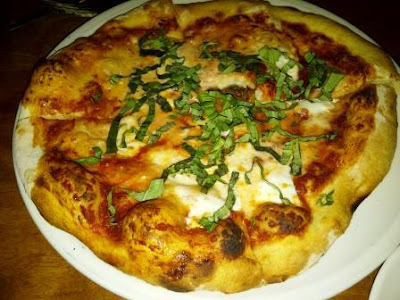 In 2010, Mia’s Pizzas made the Top 16 in a March Madness Search for America’s Best Pizzeria conducted by Rachel Ray’s Magazine “Every Day with Rachel Ray.” There is a chart with brackets, which looks vaguely familiar. Something about a final four? I’m newly impressed with Mia’s Pizzas and wonder why this is something they don’t exploit more in their promotion. I’m just glad that there is finally a playoff game I can relate to!